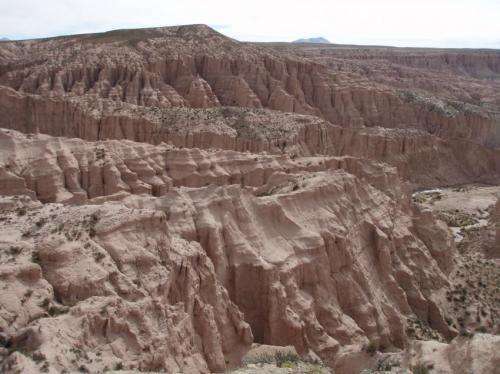 Sedimentary deposits near Cerdas in the Altiplano plateau of Bolivia are shown. These rocks contain ancient soils used to decipher the surface temperature and surface uplift history of the southern Altiplano. Credit: Photo by Carmala Garzione/University of Rochester. Scientists have long been trying to understand how the Andes and other broad, high-elevation mountain ranges were formed. New research by Carmala Garzione, a professor of earth and environmental sciences at the University of Rochester, and colleagues sheds light on the mystery. In a paper published in the latest Earth and Planetary Science Letters, Garzione explains that the Altiplano plateau in the central Andes—and most likely the entire mountain range—was formed through a series of rapid growth spurts. "This study provides increasing evidence that the plateau formed through periodic rapid pulses, not through a continuous, gradual uplift of the surface, as was traditionally thought," said Garzione. "In geologic terms, rapid means rising one kilometer or more over several millions of years, which is very impressive." It's been understood that the Andes mountain range has been growing as the Nazca oceanic plate slips underneath the South American continental plate, causing the Earth's crust to shorten (by folding and faulting) and thicken. But that left two questions: How quickly have the Andes risen to their current height, and what was the actual process that enabled their rise? Several years ago (2006-2008), Garzione and several colleagues provided the first estimates of the timing and rates of the surface uplift of the central Andes ("Mountain Ranges Rise Much More Rapidly than Geologists Expected") by measuring the ancient surface temperatures and rainfall compositions preserved in the soils of the central Altiplano, a plateau in Bolivia and Peru that sits about 12,000 feet above sea level. Garzione concluded that portions of the dense lower crust and upper mantle that act like an anchor on the base of the crust are periodically detached and sink through the mantle as the thickened continental plate heats up. Detachment of this dense anchor allows the Earth's low density upper crust to rebound and rise rapidly. More recently, Garzione and Andrew Leier, an assistant professor of Earth and Ocean Sciences at the University of South Carolina, used a relatively new temperature-recording technique in two separate studies in different regions of the Andes to determine whether pulses of rapid surface uplift are the norm, or the exception, for the formation of mountain ranges like the Andes. Garzione and Leier ("Stable isotope evidence for multiple pulses of rapid surface uplift in the Central Andes, Bolivia") both focused on the bonding behavior of carbon and oxygen isotopes in the mineral calcite that precipitated from rainwater; their results were similar. Garzione worked in the southern Altiplano, collecting climate records preserved in ancient soils at both low elevations (close to sea level), where temperatures remained warm over the history of the Andes, and at high elevations where temperatures should have cooled as the mountains rose. The calcite found in the soil contains both the lighter isotopes of carbon and oxygen—12C and 16O—as well as the rare heavier isotopes—13C and 18O. Paleo-temperature estimates from calcite rely on the fact that heavy isotopes form stronger bonds. At lower temperatures, where atoms vibrate more slowly, the heavy isotope 13C-18O bonds would be more difficult to break, resulting in a higher concentration of 13C-18O bonds in calcite, compared to what is found at warmer temperatures. By measuring the abundance of heavy isotope bonds in both low elevation (warm) sites and high elevation (cooler) sites over time, Garzione used the temperature difference between the sites to estimate the elevation of various layers of ancient soils at specific points in time. She found that the southern Altiplano region rose by about 2.5 kilometers between 16 million and 9 million years ago, which is considered a rapid rate in geologic terms. Garzione speculates that the pulsing action relates to a dense root that grows at the boundary of the lower crust and upper mantle. As the oceanic plate slips under the continental plate, the continental plate shortens and thickens, increasing the pressure on the lower crust. The basaltic composition of the lower crust converts to a very high-density rock called eclogite, which serves as an anchor to the low-density upper crust. As this root is forced deeper into the hotter part of the mantle, it heats to a temperature where it can be rapidly removed (over several million years), resulting in the rapid rise of the mountain range. "What we are learning is that the Altiplano plateau formed by pulses of rapid surface uplift over several million years, separated by long periods (several tens of million years) of stable elevations," said Garzione. "We suspect this process is typical of other high-elevation ranges, but more research is needed before we know for certain."